If it's your first time booking driivng lessons in Chingford with Book Learn Pass, you can take advantage of our new student offers. New learner drivers with Book Learn Pass can enjoy discounted driving lessons when they block book 10 or more driving lessons. We have offers available on both manual and automatic driving lessons and we also have female driving instructors working in the Chingford area too. To ensure all our learner drivers complete their tuition on time and on budget, we offer cheap driving lessons throughout Chingford. 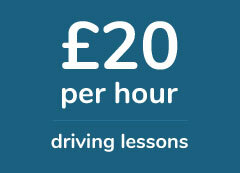 Our discounted driving lessons will help you learn to drive without spending too much money. Further discounts are available when you block book your driving lessons in advance. Book an intensive driving course in Chingford and pass your driving test in a few short weeks. Intensive driving courses are great if you need to pass your driving test quickly, or you have an up and coming driving test. Your crash course will be built around your schedule and it's great for new and experienced drivers alike. Each day consists of 4 hours driving with a 30 minute break. Start driving lessons in Chingford with Book Learn Pass and learn to drive in a fun and friendly environment. We have a range of driving courses available and we offer some of the best prices in the borough. Our driving instructors in Chingford know the local area very well, having taught in it for a number of years. Using their extensive experience, they will guide you through the driving syllabus and ensure you have the best chance of passing your driving test. We have a great reputation in the area and we are known as one of the best driving schools in Chingford. You can book both manual and automatic driving lessons in Chingford and our aim is to develop you into a safe and considerate driver. Our website is designed to make it really easy to book driving lessons online. Our customer service team operate 7 days a week and we have a policy of responding to all queries and enquiries in a quick and timely manner. Learner drivers who would like to book a driving course in Chingford over the phone, can do so by calling 07597471607. Our telephone line is open from 9:00am to 8:00pm, Monday to Sunday and our bookings team will be on hand to take your call and schedule your driving lessons. Learner drivers who would like to use our call back system to book their driving lessons are free to do so. To get started, fill in the contact form at the top of the page and once we have your contact details, a member of our customer service team will give you a call back shortly. You can also book your tuition through our email booking service. Simply send an email to bookings@booklearnpass.co.uk, include your name, location, ideal start date and the type of driving course you are interested in. Once complete, a member of our bookings team will reply to your email with a range of start dates, based on your availability. Pay for your driving lessons in peace using one of our available payment options. We have several payment options to choose from, making it easy for learner drivers to pay for their driving tuition. If you would like to pay over the phone, you can call our booking number – 07597471607 – and our bookings team can facilitate this. Upon completion, a confirmation email will be sent to your email address with your order reference number and start date. Through Paypal we accept all major credit and debit cards, so whether you are paying by American Express, MasterCard or Visa, you will be able to pay for your driving lessons securely online. We also accept payment at the start of your driving lesson too. Your driving instructor will accept both cash and card payment at the start of the lesson, as each instructor has their own mobile payments terminal. If you are paying by cash or card at the start of your lesson, you will receive a receipt and a reference number as proof of payment. Chingford Hatch: Located in and around Hatch Lane, Chingford Hatch is an area often used on many driving tests in the Chingford area. If you are located in its immediate vicinity, our driving instructors will be a happy to take you on. Chingford Mount: Learner drivers living in Chingford Mount are more than welcome to learn to drive with Book Learn Pass. The mount is another key test route in the Chingford area, testing a drivers clutch control and high street driving ability. Friday Hill: A densley poulated area in Chingford, Friday Hill is home to the major housing estate in the area. A number of learner drivers we teach in Chingford come from the location and it’s one we know very well. Hale End: If you are taking your driving test in Chingford, you may be required to join the dual carriageway from Hale End. Learner drivers based here and in the surrounding areas can book with us too. Highams Park: A residential part of Chingford, Highams Park shares a postcode with Hale End and we often pick and up and drop of learner drivers in the area. If you live or work in the location, Book Learn Pass will be happy to take you on. Chingford is located in the London borough of Waltham Forrest, alongside Leyton and Walthamstow. It shares a boundry with Buckhurst Hill, Walthamstow and Woodford Greeen. The district is made up of 6 council wards; Chingford Green, Endlebury Valley, Larkswood, Hatch Lane, Hale End and Highams Park. Local well known landmarks in the district include the Queen Elizabeth’s Hunting Lodge, originally built for King Henry VIII in 1543 and the All Saints Church which dates back to the 12th century.